Enriched with botanical extracts of Grape Seed & Soy Lecithin & Jojoba. NATURALBLEND Comfort Liquid Foundation SPF-20 is available in 3 appealing shades so that you can choose the one that best suits your skin type or tone with ease. its effortless-spread quality ensures a flawless, natural finish and ensures no clogging of skin pores. More Radiant Skin, Gives moisturized & Perfect Base For Make-Up. Does Not Clog Pores and gives even tone skin. Safe For Sensitive Skin. Explore the entire range of Foundation available on Nykaa. 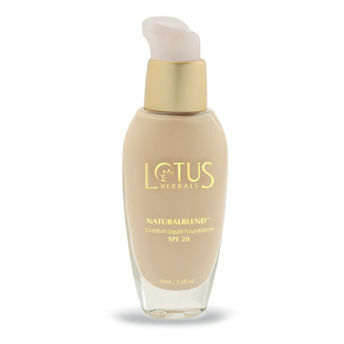 Shop more Lotus Herbals products here.You can browse through the complete world of Lotus Herbals Foundation .Alternatively, you can also find many more products from the Lotus Make-Up Natural Blend Comfort Liquid Foundation SPF 20 range.